This is a easy and fun dessert for halloween. I make it every year. 1 box (4 serving size) instant pudding mix vanilla and one butterscotch. Make each one with directions on package. 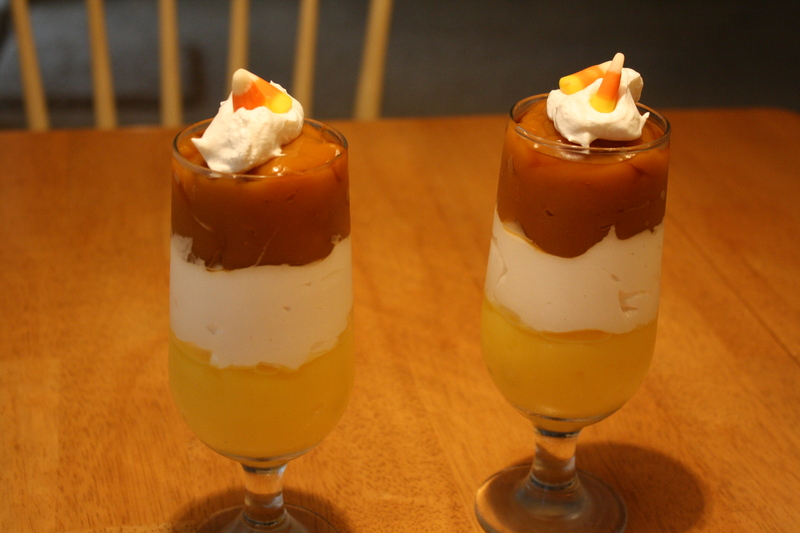 In clear glass of choice, ( can even serve in a martini glass) Add layer of vanilla pudding, layer of cool whip, layer of butterscotch pudding and top with cool whip. For Halloween, garnish with candy corn. The nice fall colors can take you thru Thanksgiving also. Can garnish with the candy corn pumpkin or a sprinkle of cinnamon or nutmeg. Very good. Light and creamy very festive. You can use fat free milk when making the pudding and fat free whip topping also if you want to cut some calories but not flavor. Enjoy! This entry was posted in Family, Food, Halloween, Holiday, Home, Recipe, special days and tagged candy corn, cool whip, dessert, entertaining, Halloween, holidays, October, party, puddding, recipe, shopworndesigns, Thanksgiving by shopworndesigns. Bookmark the permalink.